Every day or so I keep a diary to remember the events of each day. 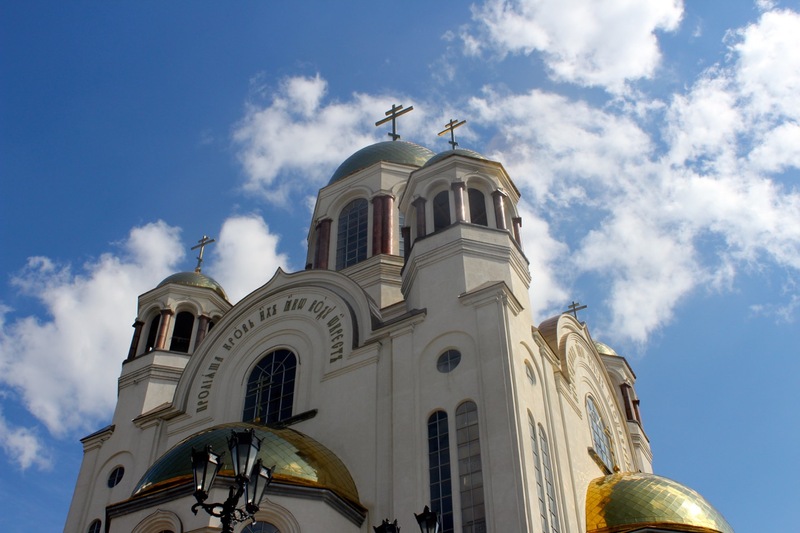 Joe suggested I type it up for you, to convey some of four experiences on the Trans-Siberian Railway. We are now on Day 3 of our very pleasant train journey across Russia. We arrived in Siberia yesterday, after two days on the train. Siberia composes most of the geographic area of Russia, but has a small proportion of the population ( 15%). Siberia is not an administrative area, but rather the entire geographic area east of the Ural Mountains. I am writing from the top bunk of our tiny cabin. The logistics are a bit challenging. For example, it is quite hard to get up to go to the bathroom at night. You risk your life going up and down a narrow ladder in the dark, so I try not to do so. But after vodka (hard to avoid here), wine, and water before and after dinner, it is hard to avoid this challenge. 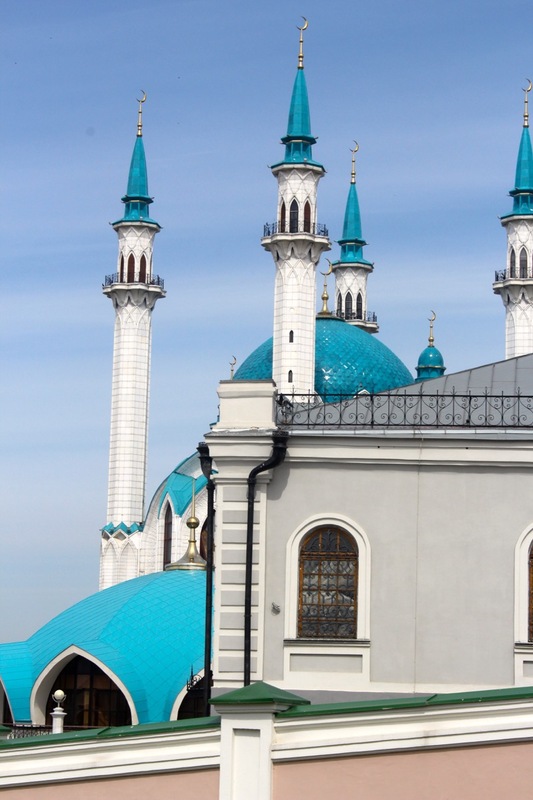 The first day we stopped in Kazan, which is the capital of Tatarstan. We are really getting a sense of the diversity of this vast and under populated) country (with about 143 million people in Russia and only 1 million in all of Tatarstan). Tatars are one of Russia’s 160 ethnic groups. They are partially self-governing (and proud of this). Katarina (“Katya”), our excellent guide throughout our trip, is from Kazan and served as our local guide. The Tatars, a Turkish-language speaking group who were converted to Islam in the 900s, were conquered by a grandson of Genghis Khan in the 1230s, as part of the widespread surge of the powerful Mongol armies into Europe and Asia. Then in turn, they were conquered by Ivan the Terrible in the 15th century, at which time they were forbidden to openly practice Islam. Catherine the Great discovered three centuries later that they were still practicing their faith, and she allowed them to openly practice their faith and build mosques. Then there was another religious persecution under Communist rule when many of the numerous mosques were destroyed. Mosques are again being rebuilt (many receiving government financial assistance), as are churches, since the 1990s; and currently mosques outnumber churches. We visited the “Kremlin” (or fortress), which is high on one of Kazan’s seven hills. (They are proud that, just as in Moscow, which has seven hills.) One of the buildings is very old, a watchtower dating back to the 14th century, but most are from the 19th century. There is also a huge and beautiful recently-constructed mosque, built with both money from Moscow and local money (but no foreign funds, although our guide said that many imams now go abroad for training, leading to a conservative trend in Islam in the country). It was built in part to commemorate the recent millennium celebration for the founding of Kazan. In general, throughout our trip so far, we are very impressed with the huge investment the national government, local governments, and wealthy people have made in rebuilding the churches, mosques, and synagogues. It is as if the entire country has been “reconquered” by the traditional religions of the past. (We have not seen much evidence of Protestant or Roman Catholic religion, however.) In addition, these buildings are not serving as museums. In all cases, we have seen active worshipers in every religious site. It is as if Communism never happened when it comes to religion (except that many of the buildings are new.) The question that keeps coming to my mind is: “How did all these people learn how to practice their religion—ie. (in the case of Orthodox churches) kissing icons, crossing themselves, praying in front of icons.” It was required to declare yourself an atheist when joining the Communist party, but many people obviously lied about this aspect of their lives; Vladimir Putin himself is a baptized Orthodox Christian and attends services on important days. While the Communists did not knock down all these buildings, they ruthlessly destroyed most of them. Perhaps practicality won out in the end in some cases, since some were used as administrative or storage facilities, and some became museums. Back to the Kazan: We took a “city tour” in the bus. There are some beautiful old buildings, happily preserved, although there are few of the beautiful wooden ones left, due both to fires and being knocked down. 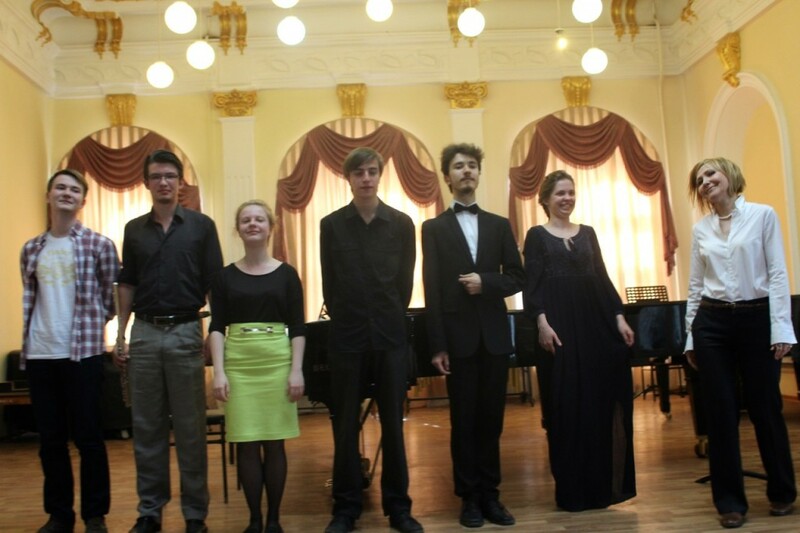 The last stop of our Kazan visit was to visit a music school where we heard an amazing performance by eight young musicians, ages 8 to 18. This school has produced musicians for orchestras all over Europe. It is impressive how pervasive music and arts education are here, and how much of a difference that makes in the cultural life of this country. Everywhere you go you see theaters and posters for concerts, and there are many museums, large and small, everywhere. We are impressed that we always see children in attendance at either concerts or in the museums. This is another way that a love of the arts is introduced at an early age. The second day of our train journey we stopped in Yekaterinburg, a large city (4th largest in Russia) that was formerly closed to outsiders in Soviet times due to nearby military facilities. The city is now trying to develop their tourist infrastructure and encourage tourism. Yeltsin lived to regret this act. As the first president of the Russian Federation after the collapse of the former Soviet Union, Yeltsin attended the ceremony at a St. Petersburg where the remains of the royal family were entered (having been discovered in a grave near Yekaterinburg) along with most of Russia’s previous monarchs. All six of the murdered royal family have now been canonized by the Russian Orthodox Church. Otherwise, I found that Yekaterinburg was not a very interesting city to visit. There is a huge statue of Lenin in the town square, and “Lenin Prospect” is the main street of the town. Apparently there were discussions about taking down the statue and changing the street’s name. For now they are leaving them because it costs money, and our guide added, “After all, this is part of our history, and the Communist Party is legal in Russia, so we might as well leave it the way it is.” They did change the name of the city back to its original name, but a lot of the “name changing” happened in the 1990s, and now there is a loss of momentum. There is a lot of what our guide called “constructivist” architecture, and I would call “ugly Soviet-era buildings.” He did point out a rather lovely “Stalin Empire” style building. I generally don’t like the Stalin-era architecture, but this one was made of red brick and had some nice statues, so not bad. We visited two other interesting sites out of town. 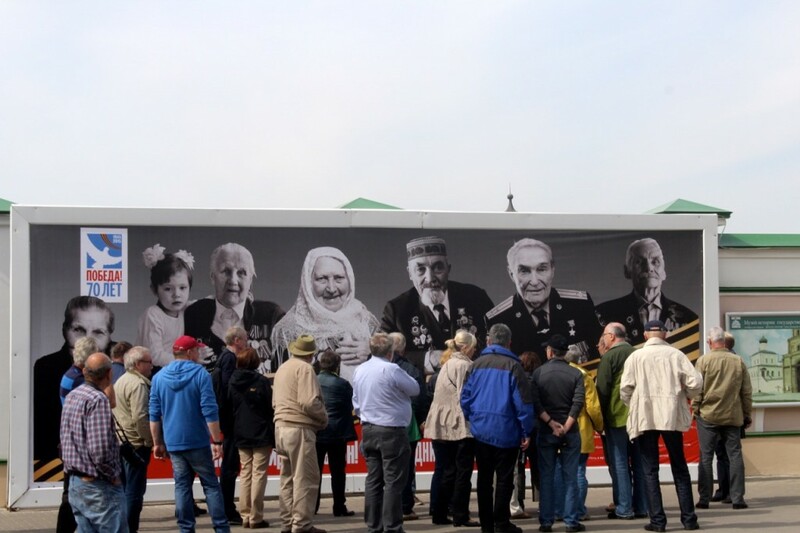 The first was a shrine commemorating the murder by Stalin’s orders of 15,000 people. There were numerous large plaques, with names of all the victims killed in 1936-37 and buried together in a mass grave. The grave was discovered when the highway was widened, and the name of each victim was found in the archives that were opened up. At last, there is the beginning of a movement to document the horrors of the massive purges under Stalin. They estimate that somewhere between15 and 20 million people were killed in the purges and died in the gulags. 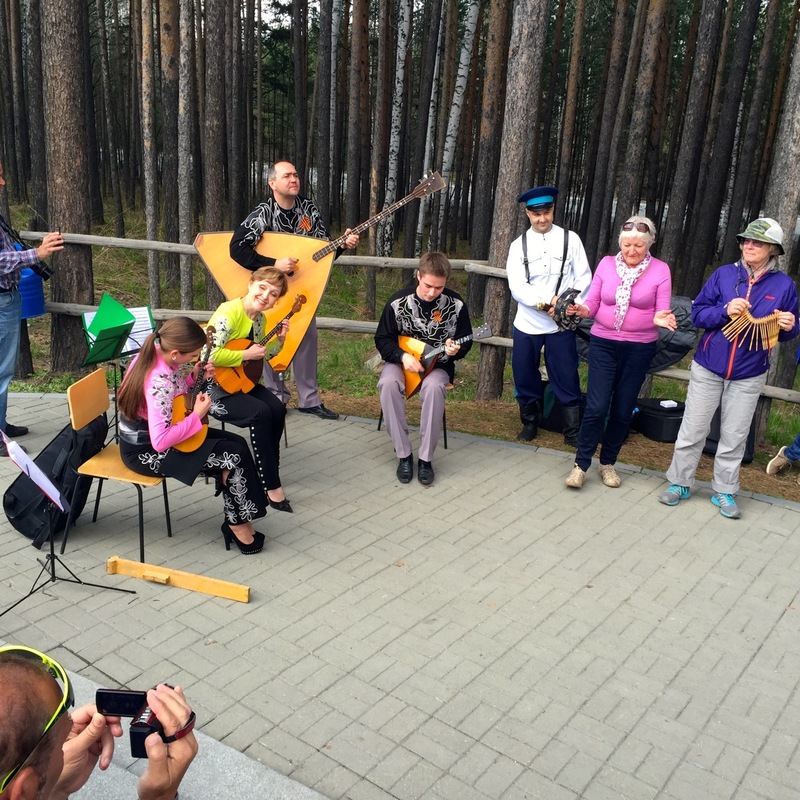 The last stop was to see a music presentation by “Cossacks” at the border between Europe and Asia, which is not far from the city. (Cossacks are not a specific ethnic group, but are rather the descendants of soldiers who were sent by the Tsars to conquer Siberia. They are now reviving some of the music and costumes of these colorful people.) I was invited to play one of their percussion instruments, and join the performance, which I did. I enjoyed reading your thoughtful and interesting observations in your most recent blog # Day #60. Your tour continues to be an amazing adventure and discovery of new sites and countries. I notice both you and Joe referring to concerts. It is interesting how the word is used to describe mostly classical music and how we use it here in the US where any presence of a musical instrument is defined as a concert. looking forward to more wonderful details from your trip. What an adventure! & what adventurers! I feel like you’re discovering not only the world but also yourselves, and something, too, of what a marriage can be (as a means toward that discovery). Bravo… that long train/ride across Eurasia, and your different and complementary accounts of it, has given me a deeper sense of the unity of the world and, at once, of its baffling intricacy. And yet,again, of the bounty of its gifts; and of the wonder of being here. Thank you!. Bon voyage encore! This blog makes me aware of the difference between mostly peaceloving populations and heir powerhungry government. Yet we forge our opinion of a country by its government. Too bad! It reminds me of ??? famous sentence: “some day, the people of the world will want peace so much that they will force their government to give it to them”.